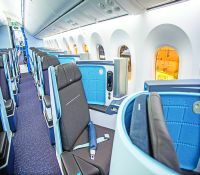 No ringing ears, no dry skin and no headaches a�� I am on KLMa��s new Boeing 787 Dreamliner, its fourth flight from New Delhi to Amsterdam, to be precise, and the pros read like an advert for a miracle pill. To be fair, after close to eight hours, the buzz around the international launch late last year seems well-founded. There is a simple explanation, of course a�� better air-conditioning, higher cabin pressure, larger windows and LED mood lighting. 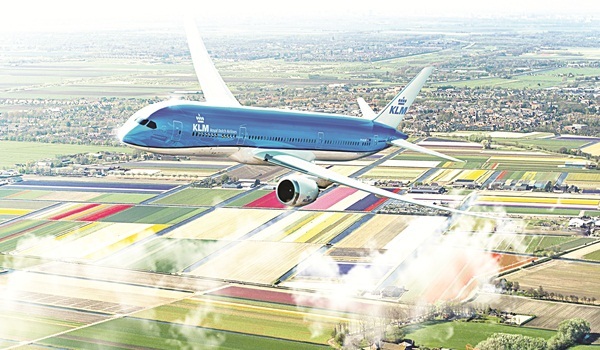 KLM informs us that it is a quieter and more fuel-efficient aircraft, and I can attest to the former. The seats are designed to sleep in (flat beds in World Business Class), are angled for better privacy and come with lighter blankets. It is inevitable that such a fine specimen must have a name. This one is Dahlia. The aircraft comes with onboard wi-fi for email and other online services, as well as better in-flight entertainment. Yet it appears passengers are more than content to snooze and make the best of the easy aisle access. Interestingly, the personal storage compartment comes with a mirror; you wona��t be fumbling around for your phone or work file in between naps anymore. As for the food, it is a welcome change from earlier KLM experiences, with a savoury pumpkin soup, fillet of cod with mustard and cubes of cheese, among other offerings. The delicate Delft Blue design is seen on the food cart and in the galley. Designer Jongerius has also used interior design tricks like colour blocking to brighten up the cabins. I learn that there are nine new destinations being planned, including Rio de Janeiro. Doha remains a popular sector. 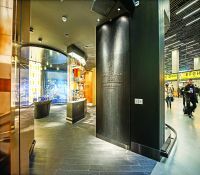 Later, when I reach Amsterdam Airport Schiphol and check into the Crown Lounge, a KLM team introduces me to an addictive virtual reality game that sees you hunting down all of the Dreamlinera��s special features. I successfully locate an espresso machine. Hungarian designer Hella Jongerius has added little details to make the interiors of the aircraft more welcoming. Recycled wool from old stewardess uniforms has been incorporated into the blue dots in the cradle-to-cradle carpeting. Dots on the curtains mimic a beaded effect, and there are handcrafted cocktail tables for World Business Class passengers with a dotted design to define personal space. Each seat comes with a locker for documents and small pouches, with the door to them providing added privacy. And an individual power socket means your gadgets will never run out of power. Youa��d never guess there were 600 takeoffs a day at Amsterdam Airport Schiphol, what with the open spaces and the sense of calm that pervades the entire facility. Known as the Gateway to Europe, over 70 per cent of the traffic here is transiting. Our charming guide, an indophile, shows us the makings of a museum featuring Rembrandts, a library with iPads, nursing stations and stress-busters like a casino, spa and a grand piano. A train to Amsterdam every seven minutes connects you to biking tours and local volunteer guides. Settle down to some fresh and fruity Nicolas Feuillatte Brut Reserve, with its discreet bubbles, or something from Netherlandsa�� largest wine estate, De Kleine Schorre, as a menu by three-star chef Jacob Jan Boerma includes anything from a smoked salmon salad to a hearty meal of meatballs or baked fish, rounded off with traditional apple pie. The ornate tableware by Dutch designer Marcel Wanders, known for his Knotted Chair at MOMA in New York, is more than welcome at 30,000 feet.